Last week, WalesOnline carried a story in which Jill Evans drew attention to Wales being omitted from a map of critical EU transport routes. She also wrote about it on her blog, here. 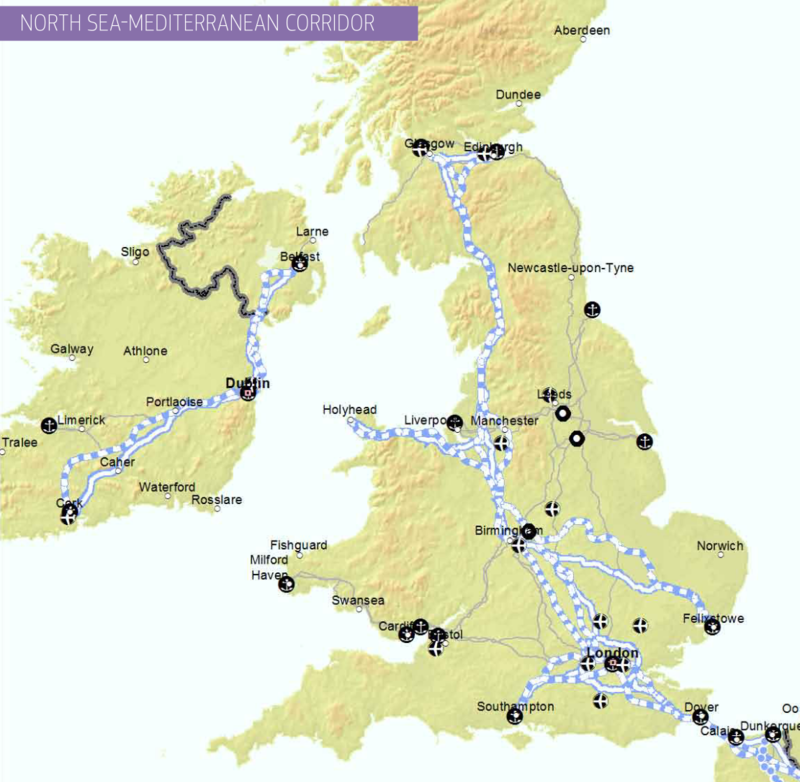 The map in question shows the main connexion between Britain and Ireland as being between Liverpool and Dublin. At first I wondered whether this was just a graphical error, so I decided to look at the actual document itself, which is here. The combined total for Holyhead is 1,898,000 ... this means that it is more than 15 times more significant than Liverpool as a port for traffic to and from Ireland. ... experience shows that planning and budgets from a national perspective do not give a sufficiently high priority to multi-national cross-border investments to equip the single market with the infrastructure it needs. This is one more example of the added value of the EU budget. With the Connecting Europe Facility, it can secure funding for the pan-European projects that connect the centre and the periphery, to the benefit of all. Parts of these corridors already exist, building on the success stories of the past TEN-T policy. But essential missing links, especially cross-border links, East-West connections, still need to be joined up. The only one of these projects in the immediate area is upgrading and electrifying the Liverpool-Manchester rail link and creating a Northern Hub. 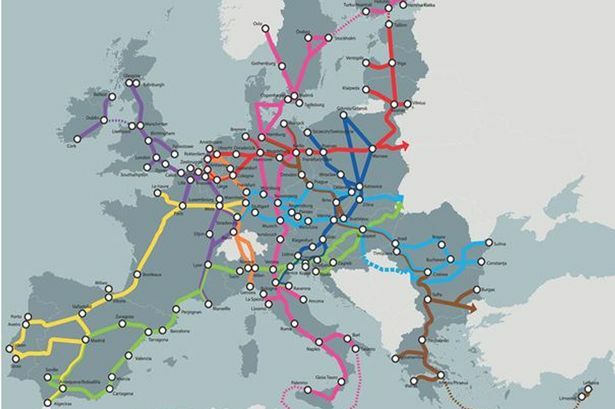 This is, of course, a worthy project in and of itself ... but it is already budgeted for and set to go ahead, and has very little (if anything at all) to do with improving the transport links between two EU member states. It therefore seems clear to me that the UKG is attempting to divert EU funds specifically designed for another purpose towards an internal project that it has already allocated funds for. This new EU funding would be far better directed at upgrading and electrifying the line between Crewe and Holyhead as part of the essential rail corridor to Ireland, a project that is still very much in the balance. In fact this EU funding could make all the difference to whether it happens any time soon or not. So what is now required is concerted action to make sure this new EU money is used for the purpose for which it is intended, rather than diverted to subsidize a project which has already been budgeted for. The Welsh Government needs to make this point, and so does the Secretary of State for Wales. After all, David Jones is on record as wanting to make the case for electrification of the north Wales main line. A fair share of the €26bn of EU funds on offer will probably make all the difference to the business case for it. Pembroke also now has substantial cruise liner traffic, I'd argue that we should upgrade the rail to both Pembroke Dock and Fishguard. I take it you are going to inform David Jones for the need to electrify the rail link from Crewe to Holyhead, together with a copy o this blog. As the figures show, Cibwr, Holyhead is by far the most important port for traffic to and from Ireland, so it is right that EU money specifically designed to improve links between member states should go to the railway to Holyhead. In fact, I would argue that if a railport were to established at Holyhead, container traffic from Ireland to the continent could be loaded directly from boat to rail, in a way that could substantially reduce the freight traffic carried by road. As you'd expect, I'd argue for the improvement of rail services everywhere in Wales. But the rail service to Fishguard was significantly improved only last year ... although the spur for that was not so much for ferry traffic, but to meet local needs. As the link I provided shows, David Jones seems convinced of the need to electrify the line, 11:47. The question is whether he has enough clout to deliver it. The fact that the UK government ignored Wales when preparing the list of pre-identified projects would suggest that he doesn't. But I don't need to send David Jones a copy of what I've written. He'll have read it already. I would say there is a case for the electrification of all the lines in Wales based on the fact that it pays back in lower maintenance costs minimum. Yes the Fishguard service has improved, but not by much.... and as for the service to Pembroke Dock too often they run a single carriage without any facilities on the line. Will a sugary drink levy pay for 1,000 doctors?